Chris is a graduate of Oberlin College with a degree in History and has completed post-graduate work in Computer Science at Swinburne University in Melbourne, Australia. Chris joins the Odyssey having directed and produced multimedia installations, websites and interactive CD-ROMS/DVDs for the National Geographic Society, The American Museum of Natural History, Lincoln Park Zoo, Jurong Bird Park in Singapore, Smithsonian Natual History Museum, Melbourne Zoo and the Ocean Alliance. In addition, he has shot video footage and provided photographs for news and documentary programs for the BBC, PBS, Reuters, National Geographic News, RAI, Sky News-Italy, Channel Ten Australia, ABC Australia, and the Discovery Channel. Having designed and developed a multimedia studio on the Research Vessel Odyssey, allows Chris to produce this website from sea as events happen on a daily basis. 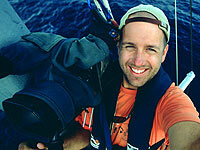 An experienced videographer, photographer and sound designer, he records and captures all aspects of the expedition. He has documented expeditions to the Sea of Cortez - Mexico, the Pacific Ocean, Western Australia, the Indian Ocean, the Red Sea and throughout the Mediterranean.